Reisig, W. (1989). 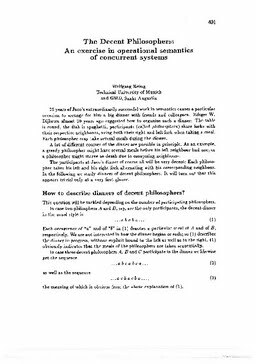 The decent philosophers: an exercise in operational semantics of concurrent systems. In J.W Klop, J.J.C Meijer, & J.J.M.M Rutten (Eds. ), J.W. de Bakker, 25 jaar semantiek (pp. 401–405). CWI.